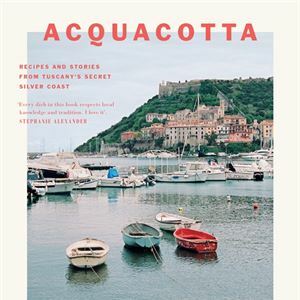 "Acquacotta is a true peasant dish. 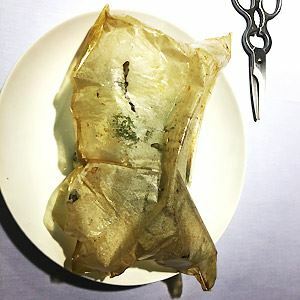 Fishermen of another time may have added a piece of long-lasting baccalà (dried salted cod) or some cheap but tasty fish brought in with the catch – the sort of fish that maybe never makes it to the market. But this is a modern version, using a popular mixture of clams, mussels and prawns – the same mix that you would find in a spaghetti allo scoglio – but you could add anything you like." - Emiko Davies. See below on how and when to purge clams. Weed out any with crushed shells (a tiny chip or crack is usually fine) or that are open and don’t move when touched or squeezed. (Rule of thumb: if they are open before cooking, they’re dead. If they don’t open after cooking, they’re dead. Throw them away). Purge the clams, if necessary, for at least 1 hour. And regardless of whether or not you’re purging, do not skimp on step 5. Scrub the mussels and pull out the beards. I like the prawns whole if they are smaller, but they can be a bit messy to eat, so you can chop them in half lengthways, right down the body, to make it easier to access the meat without getting fingers too messy. Pour the olive oil in a large casserole pot and warm over gentle heat. Cook the onion and celery, along with a pinch of salt, in the oil until very soft, about 15–20 minutes. The slower the better – do not let the onions colour, so stir them often, keep the heat low and add a splash of water if necessary. Add one of the garlic cloves and the chilli, cook for 1 minute, then add the tomato and 500 ml (17 fl oz/2 cups) of water. Season with salt and bring to a simmer. Cook gently for about 40 minutes, topping up with water if it begins to look too thick. 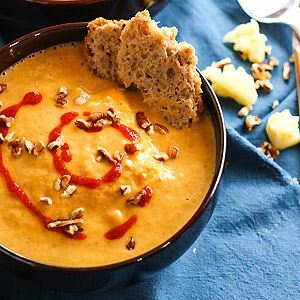 In the meantime, prepare the bread – stale bread is best as it soaks up the liquid without becoming soggy. If it is not stale, you can dry it out in a low oven until crisp. Rub the bread once with the remaining garlic clove. Add the prawns, mussels and clams to the simmering liquid. Cover and let them cook for about 2 minutes, or until the shells have opened and the prawns are just cooked. Remove from the heat and stir through the parsley. 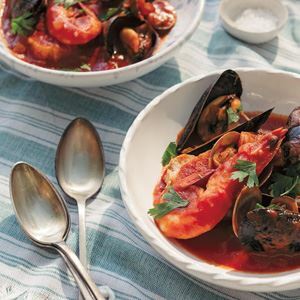 Place the stale bread in the bottom of the serving bowls and scoop the acquacotta over the top of them, distributing the seafood evenly. 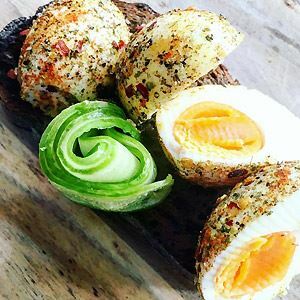 In a seafood cookbook called La Cucina Toscana di Mare, by prolific Italian food writer Laura Rangoni, there are two enticing seafood acquacotta recipes. One features fresh and salted anchovies and silverbeet (Swiss chard) together with the tomato based soup. Instead of poaching the eggs in the soup, Rangoni beats the eggs with a handful of grated pecorino cheese and pours this over the top. The other is an acquacotta with chickpeas and wedge clams, which are first cooked so the clam meat can be plucked out, then added to the soup without their shells. She sprinkles grated pecorino cheese on the bread first, then pours the acquacotta on top. Clams are sold live and need to be prepared with care. To prepare clams before cooking, it’s traditional in Italian kitchens to purge them of any sand that might be inside the tightly shut shells – there’s nothing worse than biting into sand while eating your pasta. The idea is to filter the sand out by soaking them in water. Everyone has different advice on how to do this, much of it filtered down through family lore and a persistent series of old wives’ tales. I take the advice of lifelong clamming experts such as Hank Shaw (American journalist, forager and author of Hunt, Gather, Cook) and the excellent blog Honest Food. Both offer more in-depth advice on the subject. The first thing to know is that most commercially available clams and mussels have already been filtered. If you’ve bought your clams in a supermarket, they are likely to be ready to go – just follow step 1 below for weeding out any bad ones and step 5 in case there are any closed dead ones hoarding a shellfull of sand. Trust me on step 5 – it sounds tedious but this is the most important step! If you have even one of these dead ones open in your pan while tossing, your entire dish will be ruined. If you’re sourcing them from a fishmonger and you’re not sure, just ask if they have already been purged. Rinse clams quickly under water, weed out any with crushed shells or that are open and don’t move when touched or squeezed. Put the clams in a large non-reactive bowl (such as glass or ceramic). Cover the clams in salt water by 2–3 cm (¾–1¼ in). Actual seawater (filtered to remove any sand) is best, of course, but otherwise use sea salt (not regular table salt) and water to a salinity of about 3.5% – or 35 g (1¼ oz) to every 1 litre (34 fl oz/ 4 cups) of water. Fresh water will kill the clams. Try not to shock them to death by changing their temperature too rapidly so keep them somewhere relatively close to their current temperature. If they have been stored chilled (for example, at the fishmongers), then you can use cool water and keep them chilled in the fridge. Otherwise, set them somewhere like in a cool corner of the room. Purge for at least 1 hour. I find this time sufficient for clams bought from the fishmonger. If you leave them for significantly longer than that, check on them from time to time and change the water so they don’t die from loss of oxygen. When you tap or agitate them, they should close (perhaps slowly, but they should eventually completely close). The last thing you want is to forget about them and come back to a bowl of dead clams. Transfer the clams to a colander using your hands or a perforated spoon (don’t tip the water out directly into the colander as you’ll end up pouring any purged sand back over them). You’ll see Italian fishmongers tapping or bouncing their clams on the counter to weed out any dead ones that look like they are closed. It's incredibly important to do this (if you’ve got little ones running around, they might like to help). With a plastic chopping board underneath, tap or bounce the clams one by one. Live ones will stay tightly shut. If there is a dead one in there, it will open when you do this – and will likely be full of sand that you’ve just saved from getting into your sauce. Now they’re ready to cook. Credits: This is an edited extract from Acquacotta by Emiko Davies published by Hardie Grant Books RRP $49.99 and is available in stores nationally from 1 March 2017.